Yesterday we took a little road trip to the Yorkshire Dales. It's not that far from Leeds, just over an hour by car to Horton-in-Ribblesdale, where I dropped off my husband (he went off to walk Pen-y-Ghent in practice for his Three Peaks Challenge later this year). Harry and I then went on to spend a few hours exploring before returning to collect him in the afternoon. After our beautiful weekend stay back in March at Burtersett Cottage, we'd been longing to make a return visit to explore the area more. As we'd all been poorly over that particularly weekend, we hadn't got out as much as we'd liked and one of our planned trips was to see the waterfall at Hardraw. It's a very short drive from Hawes, and easily within walking distance from there too. I had been disappointed at missing out on going there back in March, but after our visit yesterday, I now feel so pleased that things worked out that way. The sun was out in full, jackets came off and we could even sit outside to have our lunch. The Yorkshire Dales are always beautiful, with so much to take in and appreciate, from the wildlife, the ruggedness of the land, the dry stone walls that criss-cross the steepest of hills to the prettiest of villages. But in June the Dales are something else to behold, a wildflower heaven with field after field of yellow buttercups happily nestled around the Traditional Farm Buildings, bluebells still looking pretty showy under the woodland canopies and white pompom heads of the cotton grass bopping in the breeze and covering vast acres of land. It's simply spectacular to look at. 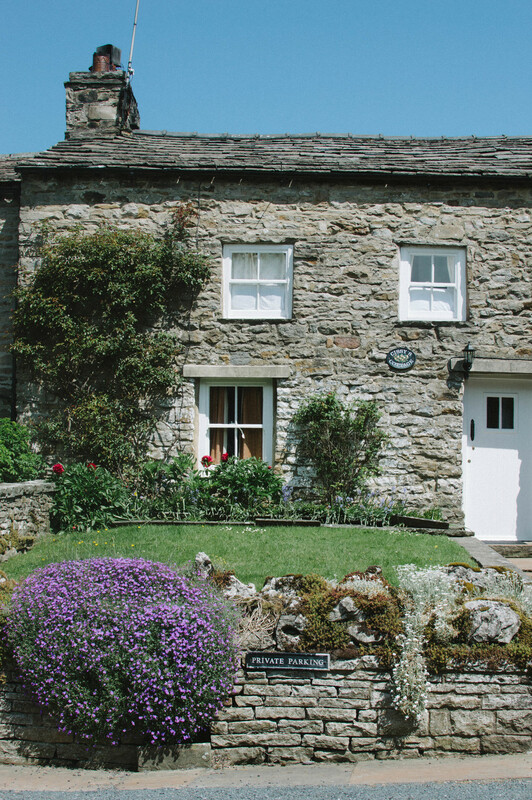 The village of Hardraw is Yorkshire Dales picture postcard pretty - stone cottages, doorways covered in climbing clematis, flowering alpines spilling out over the top of the dry stone walls and peeking out from tiny nooks and crannies. We parked the car on the main road and wandered off for a bit of a nosey and I was delighted to discover a little secret garden, open to the public, in a really shady spot next to the river. 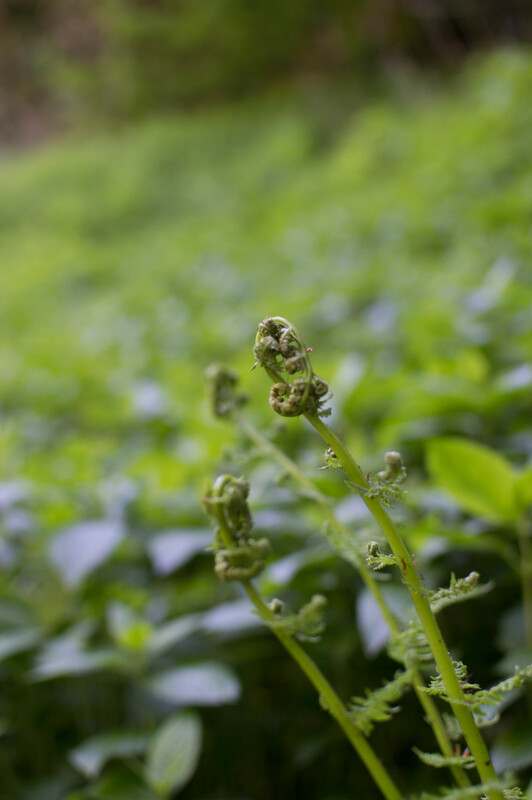 There was no-one else there, only the birdsong for company and I happily admired the planting and what was flowering in deep shade. Across the road is the Green Dragon pub, where you gain entrance to Hardraw Force, England's largest single drop waterfall. You wander out the back entrance, up a little lane until you come to the newly built Heritage Centre which houses a cafe, toilets and a little outdoor seating area for visitors. After we paid our admission (£2.50 adults/£1.50 kids), we headed to the waterfall and immediately came across some baby rabbits darting in and out of the fields next to us, with quick flashes of white bottoms disappearing through the cracks in the walls. 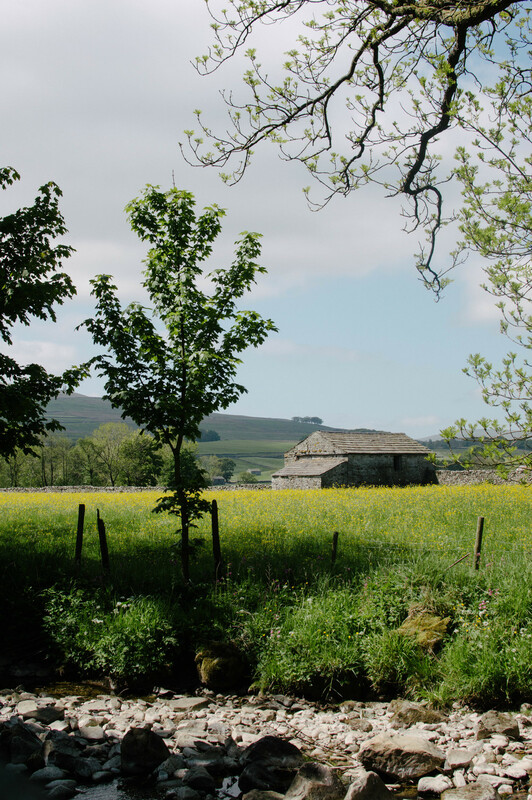 There were several tents camping in the field too and it must be a great place to do that in the Dales (we're definitely going to do that next year), although facilities are super basic - there is water, toilets and a shower, but nowt else! Although, who needs it when you have a rather gorgeous pub only a few feet away? 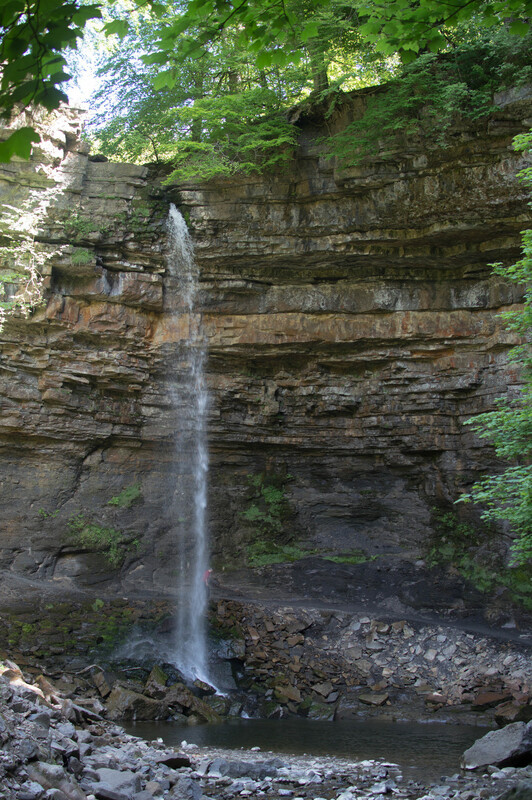 Along the path, which is well maintained, buggy and wheelchair accessible, is the waterfall. We'd read online that if there hasn't been a lot of rain then it's not that impressive, and it has been rather dry recently, but it was still looking pretty spectacular to me (if you look really closely at the path in the picture below, you'll see that there is a man behind the water which gives you some idea of how huge this drop is!). 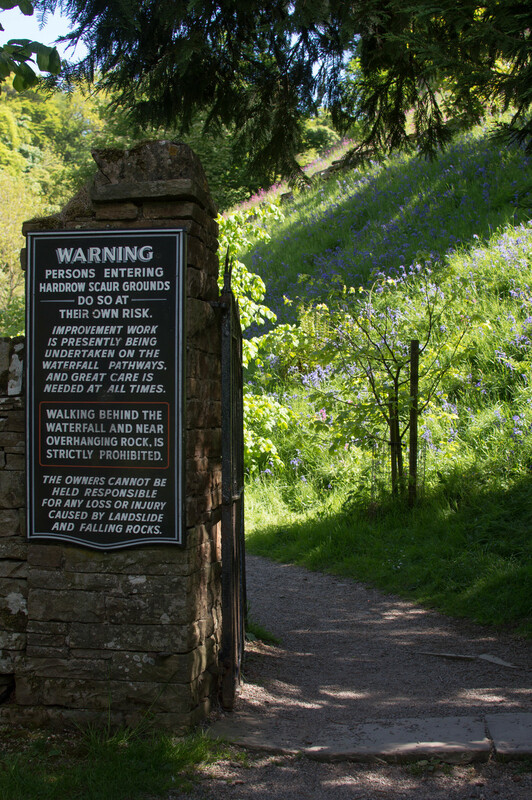 There are warning signs up stating that you are not supposed to walk behind the waterfall but lots of people seemed to ignore that, although we were good and just admired it from the gate. It's a very beautiful place, quiet even with lots of people, as most are simply admiring the wonder of nature. There are lots of paths to wander off the beaten track and plenty benches and picnic tables to sit down at, so you could easily spend all day here. Alternatively head back to the Heritage Centre for an ice cream, a pub lunch or even a swift half in the Green Dragon (which is really nice inside too - think old world country pub complete with roaring fire). How I wish I'd not been driving! After exploring Hardraw we headed to Hawes for a visit to the Wensleydale Creamery for cheese supplies and a browse of some of the local shops where I picked up a couple of lovely vintage finds. Then it was off back in the car to pick up the husband at the Pen-y-Ghent cafe where we had a cuppa in the sunshine. All in all, a perfect day here in Yorkshire.